The River & Rail Café on Bank Street in New Milford is already making a name for itself. The owners, Ethan and Nicky Grievous, opened the dining establishment at the start of the year. A new full-service café on Bank Street in New Milford has caught the attention of townspeople. River & Rail Café at 21 Bank St., formerly the home of Dagwoods, opened on Jan. 4. “I love the ambiance, the coziness,” said resident Rachelle Goldberg of New Milford, who has been to the café four times. Ethan and Nicky Grievous purchased the building that houses the café in August. With the help of family, including her contractor-father and her designer-mother, they transformed the space into their vision — a space for the community to relax with friends and enjoy a meal. “We both wanted to open a business together and incorporate all the elements we believe people deserve when they go out,” Nicky Grievous said. She works the front end of the cafe, where she can focus on her passions — coffee and community. Ethan Grievous showcases his culinary skills creating dishes in the kitchen. “I like to see people hang out talking, having coffee and having a good time,” he said. The café’s breakfast menu includes ham and cheese on a croissant, Brioche French toast, and apple cinnamon crepes. The lunch menu includes Gruyere and Fontina grilled cheese on Pullman bread, roasted turkey club, and a trio of roasted vegetables on rosemary focaccia. Soup and salad options, and children’s menu are also available. The owners expect to add snacks such as cheese boards and flat breads. “There’s nothing else I would rather do than get up at 4 a.m. and make pastries,” he added. The couple hopes to make their own breads in the future. In addition to food, the café plans to offer live music and open mic poetry events. 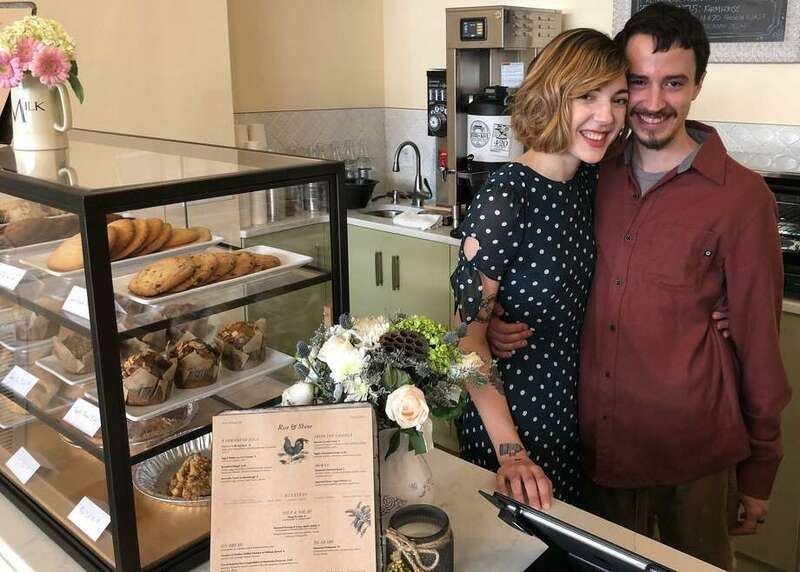 The couple, who celebrated their first wedding anniversary in September, initially thought they’d find a space in New York’s Hudson Valley, but after exploring western Connecticut, the charm of New Milford spoke to their hearts. The business features five small round tables with chairs, two counters that overlook Bank Street. A counter along one wall boasts River & Rail Café hats and T-shirts, coffee cozies, and chocolates. Customers can order at the counter, then sit and be served, or they can sit and order. Takeout and catering is available. The owners said pursuing their dream together is fulfilling. “We go to bed with a smile and wake up with a smile,” Nicky Grevious said. Ruscil, who described the café as “beautifully decorated, with great attention to detail,” said she appreciated how “accommodating” the owners are to allergies. “They assured me that if anything I ordered wasn’t what I expected, they would be happy to let me have something else,” she said. Ruscil also praised the café’s coffee, which the owners get from Ethan Grievous’ native Virginia. River & Rail Café at 21 Bank St. in New Milford is open daily from 8 a.m. to 10 p.m. For more information, call 860-799-7272.